Storm Racer G is an arcade driving machine that takes arcade racing to the next level of fun and excitement with its super fast driving experience. In Storm Racer G, players can race up to 14 different cars in either with automatic and manual transmission, across 12 different tracks! Each car is unique with it's own strengths and weaknesses, which provides more choice and different cars to suit all styles of racing! 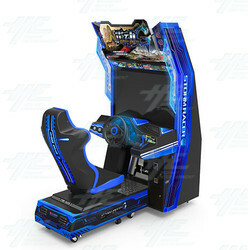 The Storm Racer G cabinet features a streamlined racing car seat, attractive blue and black cabinet art, LED lighting, 42' LCD with HD graphics, and a unique throttle for quick speed boosting in-game! The cabinet is also linkable up to 8 players/units for a more competitive arcade racing experience! In Storm Racer G, players can race up to 14 different cars in either with automatic and manual transmission, across 12 different tracks! Each car is unique with it's own strengths and weaknesses, which provides more choice and different cars to suit all styles of racing! The Storm Racer G cabinet features a streamlined racing car seat, attractive blue and black cabinet art, LED lighting, 42' LCD with HD graphics, and a unique throttle for quick speed boosting in-game! The cabinet is also linkable up to 8 players/units for a more competitive arcade racing experience! Linkable up to 8 players! Auto / Manual drift mode for Beginners / Experts! 12 tracks, 6 of which have to be unlocked! 14 cars, 7 of which have to be unlocked!